Ripe pecans on the tree; photo by Corey Leopold on Flickr (use permitted with attribution). 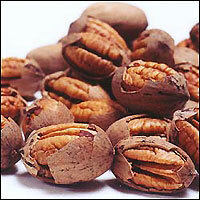 The pecan tree is native to North America and was an important food for native peoples. 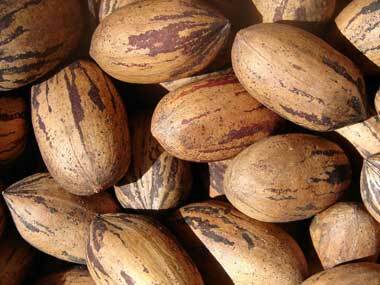 "Pecan" is an Algonquian word that means "requires a stone to crack." Some of the many varieties of pecans are named for Native American Indian tribes such as Apache, Cheyenne, Mohawk, Sioux, Choctaw, Seminole, and more. Both George Washington and Thomas Jefferson grew pecan trees, and astronauts took pecans to the moon on two Apollo space missions. Americans love pecans. There's a Pecan Day, a Pecan Cookie Day, April is Pecan Month and pecan pie is the official state pie of Texas! Photo © The Bragg Pecan Store (used by permission). 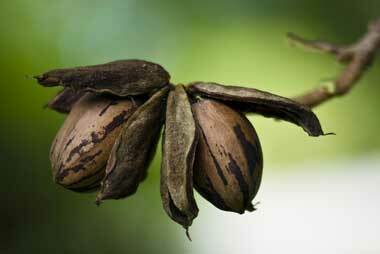 Pecans in the shell; photo by Martin LaBar on Flickr (noncommercial use permitted with attribution).